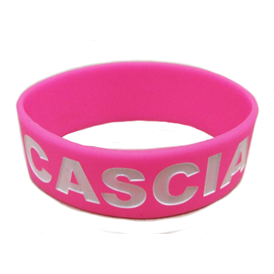 Get noticed with this 1" WIDE Silicone wristband. Debossed image with one color fill. Pricing includes choice of one PMS matched silicone color with one PMS matched color fill. SW-3100 with a 360 degree design has a 7/8" H x 7-1/2" W design area. For Multi color bands add 0.10 (C) for each additional silicone color. For silicone color change add $40.00 (G) setup per color (500 piece minimum per color. SW-0502 - Glow in the dark, Debossed with choice of one PMS matched color fill. Frosty white silicone changes to glow in the dark green, red or blue (choice of one). Youth size: 7-1/8" circumference x 1" x 2mm. Requires tracking label and safety testing if intended for 12 year olds and under. Please add 0.04 (A) for tracking label. Call for pricing for safety testing. 50.00 (G) sample charge plus set-up charges. Sample charge only is refunded with order placed. Preproduction sample add 2 weeks to delivery. Overnight shipping charges apply. 3 weeks from approval of paper proof or pre production sample.